We have recently discovered, rummaging through the vast archives maintained by Ion Ratiu (6 June 1917-17 January 2000), the great Romanian democracy campaigner, businessman and philanthropist, some extremely interesting materials documenting an act of defiance of Ceausescu and his regime, at a time when the Romanian dictator was still the darling of the West. Exactly 30 years ago, in 1978, Nicolae Ceausescu visited the UK. On this historic occasion, the Romanian president demanded and was accorded full state-honours, mainly in order to facilitate an important UK-Romanian aerospace trade deal. To dramatically highlight the appalling human rights situation in Romania, Ion Ratiu, one of the most outspoken critics of the Communist regime, organised a protest in front of the hotel where Ceausescu held a reception for the Queen. 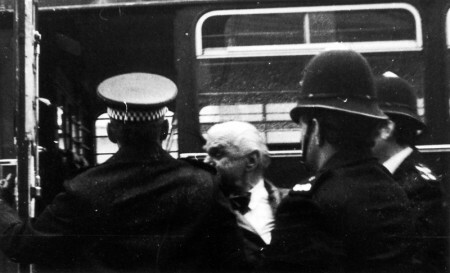 At the time the UK Government had unofficially agreed to �shield� Ceausescu from any unpleasantness arising from demonstrations. 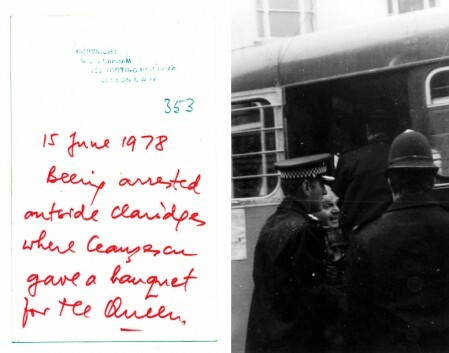 Here is a description from The Times, 16 June 1978: �Protest halted: Police last night stopped a demonstration by Romanians outside Claridge's, where Mr Ceausescu gave a banquet in honour of the Queen, one of the protesters said (a Staff Reporter writes). Mr Ion Ratiu, a former Romanian diplomat who is now a London businessman and chairman of the Romanian-British Association, was arrested, charged with obstruction and, he claims, detained at Saville Row Police station until the President left the hotel. The protesters, carrying placards comparing life in Romania to Orwell's 1984, said they were fenced off with railings and a coach was used to block them from Mr Ceausescu's view. Arthur Reed, Air Correspondent, writes: �The deal, under which Britain will pass on its expertise in building BAC 1-11 airliners to Romania and help it to establish a self-contained production line, is the biggest between two countries involving civil aircraft.� The Times, on 20 September 1978, comes with a follow-up: �Ion Ratiu, aged 61, president of the British-Romanian Society, was granted an absolute discharge at Marlborough Street Magistrates' Court yesterday for obstructing the police during a peaceful demonstration in London against alleged violations of human rights in Romania�. It was said later that the Romanian Government paid for the BAC license through a series of barter deals � including substantial deliveries of rotten strawberries!